BRING THE CAKE AND EBDC WILL TAKE CARE OF EVERYTHING ELSE! Have your next birthday party at East Bay Dance Company! Guests will take part in a full dance lesson. Dance experience is not required as we make everything friendly enough for those first time dancers! Guests will play fun games and enjoy arts & crafts (if requested). 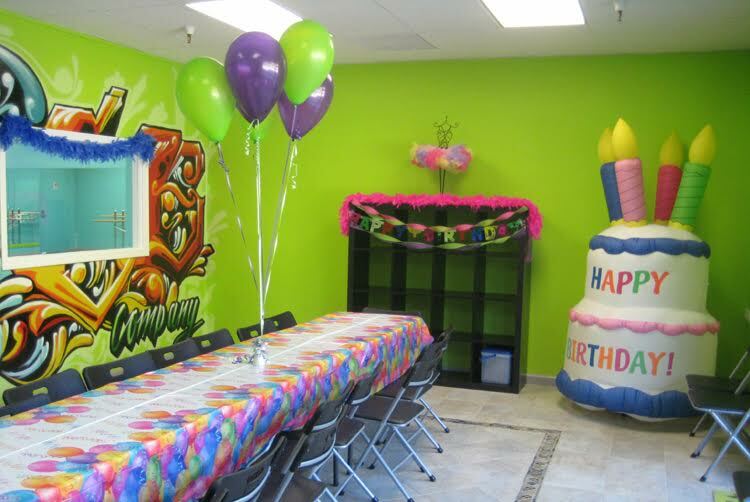 Dancers will then make their way to our fully decorated party room (generic decorations supplied by EBDC), where they can enjoy snacks and cake! Towards the end of the party dancers will then perform the dance routine for mom and dad that they learned at the party. Remember to bring your camera because you won't want to miss a second of all of the action! • Diva Hair & Make-Up Glam! • Top Model Party - Walk the Runway! OUR CURRENT AVAILABLE DATES - Saturdays 12:30pm-2pm or Saturdays 12:30pm-2:30pm : Email Us or Call To Check Studio Availability. Parties are designed for up to 20 participating guests, max. $100 Deposit required to reserve date. If a party guest remains for 15 minutes over the designated ending time, a $25 fee will be added to the price of the party. 1.5 hours or 2 hours. Full dance lesson and release forms. Deposit is non-refundable and is due at the time your party is booked. The remaining balance is due on the date of your party.